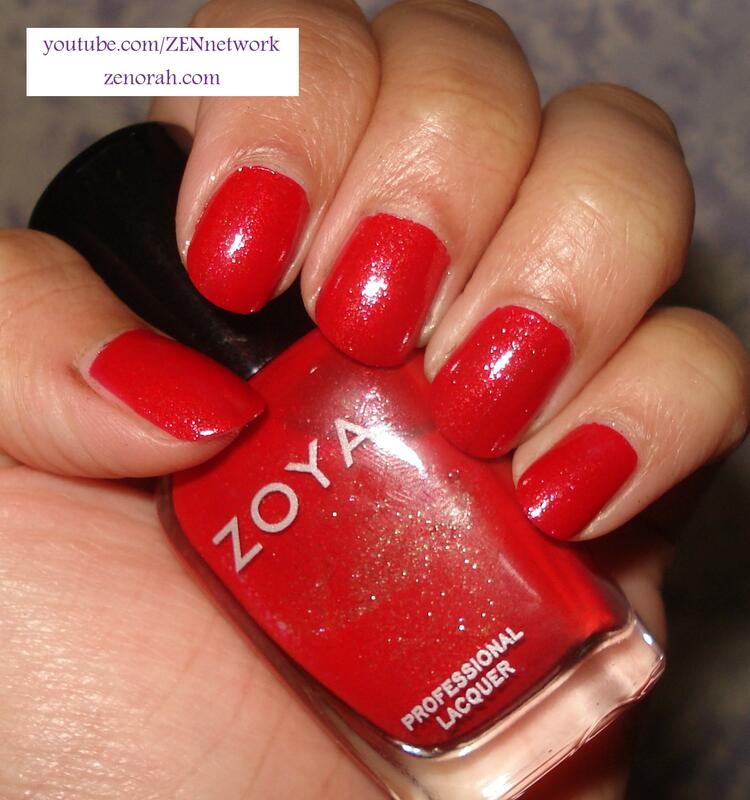 Zoya Nidhi – is an orange based tomato red packed with gold shimmer. This polish was released in Zoya’s Sparkle Collection 2010 and was sort of the odd ball amongst all the polishes in that particular collection. Meaning, it did not have the ‘sparkle’ component instead it had gold shimmer which kind of disappointed me at the time but I have worn this polish enough now to say – it really is beautiful and did not need the extra ‘sparkle’. While ‘red’ is not the first colour I think of wearing in the summer time (although I wear the heck out of it in the remaining seasons) – I like that I can actually rock this one without missing my blues, greens, corals etc during the summer time. I like pairing this polish with two completely different looks, the first outfit is basic but classy – a really sophisticated black pencil skirt with white shirt and gold jewelry, in essence it is my way of embodying the ladies during the time period of the show “Mad Men”. And the other outfit is just the opposite, love wearing lots of colourful tribal patterns or leopard print top or dresses with really fun summery heels and easy messed up hair. In essence, it is a diverse polish to have in your collection and while I have A LOT of red nail polishes – this is one I am most drawn to, to wear in the summer months. I have tried wearing it during Fall and it just does NOT work! The orange based, tomato like colour is definitely one to rock all summer long because she will be back on your shelf for the remaining months. The best part of this polish is the application – this is a ONE coater if you wish for it to be. I always do two coats no matter what but you can get away with one opaque coat of polish. The drying time was excellent making it a ‘GOOD Zoya’ polish and I like the fact I have a red polish that I can slap on and go! I was debating with myself if I should consider this a must have because it has so many amazing qualities in a nail polish. Period. However, every nail polish company makes several ‘red’ nail polish shades in their arsenal so there are A LOT of red nail polishes to choose from and from that perspective – I can say : If you really LOVE Zoya polishes and REALLY want to try out a few of their reds then this one gets my vote as a beautiful summer red polish from their line up. But I don’t blame you if you pass on her either – it is hard to find a ‘unique’ red polish these days. (Only reason it did not receive a higher grade was based on level of “must have” status). Do you own Zoya Nidhi? What are your thoughts on this nail polish?